Bring the classic story of Goldilocks and the Three Bears to life with this darling play set. Start by reading the included storybook and then build the Three Bears’ house and furniture. Use the Baby Bear, Mama Bear, Papa Bear and Goldilocks dolls to act out your own version of the fairytale. 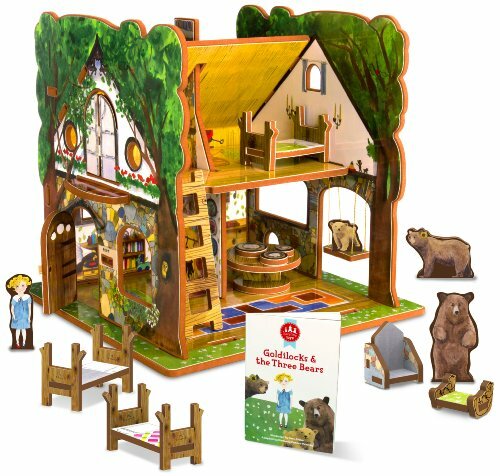 The Goldilocks and the Three Bears toy house includes a working swing and a tree house for Baby Bear. Each bear has its own bowl of porridge, chair and bed. The side of the toy house folds in half to make a swimming pool and there are many secret animals hidden in the artwork all over the tree.